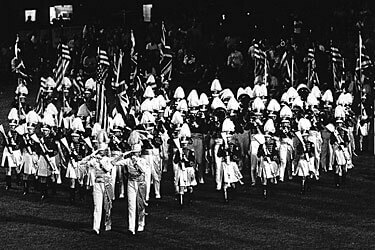 As Drum Corps International moves into the new fiscal year this November, it will also embark on the celebration of the 35th anniversary of the organization's founding in 1972. It has been 35 years since, according to some accounts, an infamous meeting between Troopers' founder Jim Jones and Cavaliers' founder Don Warren that took place in the men's restroom at a Delavan, Wis., competition. There the two started a conversation that planted the seed to form an organization governed by the participating groups, rather than the outside veterans' organizations that today's drum corps activity has evolved from. The Anaheim Kingsmen perform in this archival footage of the inaugural 1972 DCI World Championship in Whitewater, Wis. The Kingsmen won the very first DCI World Championship title. "After 35 years, DCI has become much more than I thought it would be," said David Kampschroer, DCI Hall of Fame member. Kampschroer was one of the charter corps directors of the Midwest Combine in 1971, the predecessor to DCI's founding in 1972. He worked actively as one of the founding fathers of the new DCI organization and served as one of its first executive directors. Today, Kampschroer chairs the DCI Hall of Fame committee. "From the start, I was just hopeful that DCI would become a great booking agent offering great facilities for performances rather than relying on the competitive organization of the church, VFW or American Legion," said Kampschroer. "The organization definitely has met and exceeded my original expectations." With many challenges faced along the way, the continued success of Drum Corps International today has been built upon the foundation of hard work and perseverance created by the original founding members and sustained by the drum corps that have followed. "There were so many junior corps in existence in 1971, when DCI was conceived, that I felt that it had a great chance to succeed and last a long time if the directors selected a group of wise, broad-minded, 'big-picture' people to run it and steer the activity," said Dennis DeLucia, noted percussion educator and DCI Hall of Fame member. "It was shaky for a few years, but we're still here 35 years later!" Much of Drum Corps International's success today also has been a direct result of the organization's ability to revise, incorporate and enact new rules, performance and business techniques both on the football field and in the board room. Today's rules are a far cry from those that were used in the 1970s, like those that allowed corps to only play music at tempo markings near 120 beats per minute and those that required corps to start and finish their programs in the football field's end zones. "I feel that the most significant thing to have happened over the last 35 years is the change in the judging system," said Clarke Williams, a DCI Hall of Fame member who was on the judging panel at the very first DCI World Championship in 1972. 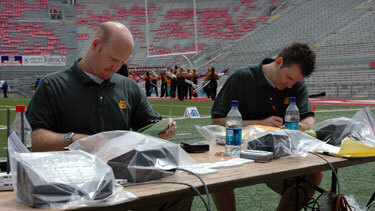 The original judging system used in DCI competitions was based on deductions from 100 points for recorded errors. Today's judging system acknowledges and rewards achievement in all areas. 2006 World Championships in Madison, Wis.
"That judging change brought out the best in design and the best in performance year after year. It encourages creativity and encourages risk-taking. Design teams have excelled and performers are now asked to play better and move better as a result. It has allowed us to design vocabulary in the visual caption that compares to the vocabulary we have had in music for so many years," said Williams. Today, Drum Corps International is experienced by hundreds of thousands of fans who attend live events and millions of fans through new initiatives like the broadcast of the World Championship on ESPN2, live broadcasts of events in major-market theaters and live video streaming through the DCI.org Web site. Drum Corps International is Marching Music's Major League?„?. "Over 35 years, Drum Corps International has been legitimized as the world leader and model that all marching music groups strive for," said Kampschroer. "I'm talking about some mighty fine bands as well. Many bands today got better because they were awed and influenced by some of the best drum corps groups since the 1960s, 1970s and 1980s into today." "In terms of criteria such as the number of shows, bigger and better venues, enormous attendance figures, television exposure, special nights in movie theaters, DVDs, influence on music education and bands, DCI has become more than most of us ever expected it could!" said DeLucia. "The incredible growth in the quantity and quality of bands, color guards and indoor drum lines is a direct result of the success and influence of the corps of Drum Corps International." 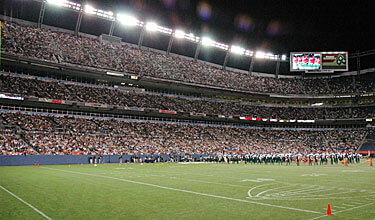 Santa Clara Vanguard performs for a crowd of more than 22,000 at the 2004 DCI World Championships in Denver, Colo.
Williams added: "This has become a global activity providing memorable moments for members from the United States and Canada to perform abroad, and it has allowed for members to come from as far away as Japan and Korea to learn and perform in North America. In this country, the drum corps influence has helped the high school marching band activity explode, allowing students to achieve at high levels. That level seems to be growing each year, just as it is with drum corps." Over the next year leading into the 2007 Summer Music Games Tour, Drum Corps International and its member corps look forward to celebrating 35 years, as participants, instructors and fans savor the history of its legacy, while focusing on the future as a new chapter is opened in the history of the world's most elite and exclusive marching music ensembles.